It’s rare for Gibraltar to make news, but it’s already done so early in 2011, with Spain’s main opposition party accusing the tiny British territory of being a “bad neighbor” in a dispute about coastal water rights. Those comments have prompted yet another round of debate among Spanish politicians about whether Gibraltar’s future will involve sovereignty, continued British rule or a (highly unlikely) return to Spain. While Gibraltar’s seemingly incongruous placement as a wee slice of Britain along the Spanish Mediterranean has long been a sticky wicket for those two nations, the same odd juxtaposition helps make it an intriguing side trip for anyone traveling in the south of Spain. My visit came just a day after going to the Alhambra in Granada, as a friend and I decided to make a stop while driving along the Costa del Sol before heading northwest to Seville. We figured it would be a nice change of pace in the middle of our two-week journey through Spain — and we were right. As we drove west from the coastal town of Nerja along the A7 highway, Gibraltar soon announced itself dramatically. Its eponymous rock appeared through the haze in the distance, serving as a handy guidepost. The great monolith’s shape was instantly recognizable, and its sheer size relative to its surroundings was pretty impressive – it towers nearly 1,400 feet above a quaint town and spreads out lengthwise over most of the peninsula. After leaving our car at a meter in an adjacent Spanish town, we walked across the street and passed through what has to be one of the easiest border crossings in the world. With a wave of a U.S. passport, it took just a couple minutes and, when I asked for a stamp, the customs agent sheepishly apologized for not having one on hand. Once cleared, we hopped a shuttle bus for the very short trip into the town center. The territory itself takes up less than three square miles, and though it houses nearly 30,000 residents in that tight space, it’s home to even more history. 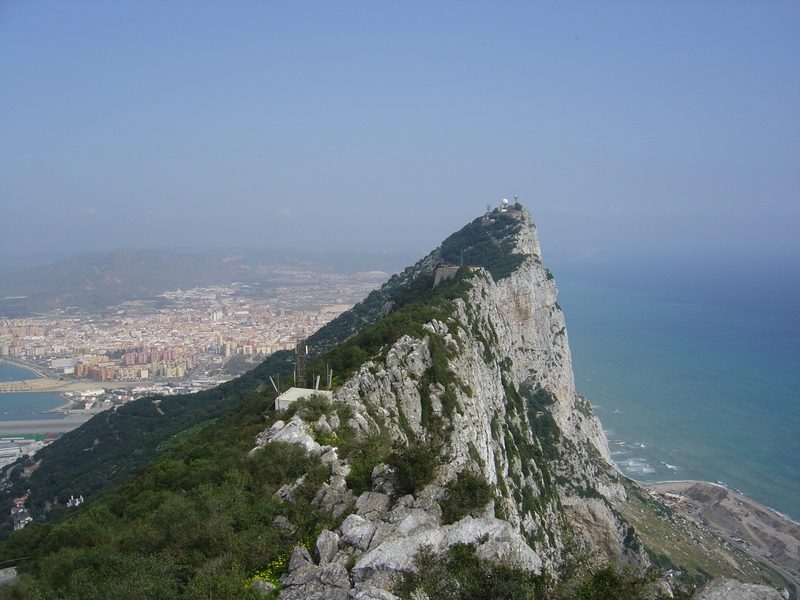 As far as we know, Gibraltar was likely the last place Neanderthals lived. Greek mythology credited Hercules for the rock’s creation, and Plato placed the lost Atlantis somewhere past the strait that separates Gibraltar from mainland Africa. At various points, Carthaginians, Romans, Visigoths and Moors took turns claiming the peninsula. In 1713, of course, it passed from Spain to Britain and — despite both military and political attempts to retake it — it remains part of the Commonwealth. Walking around, it was immediately apparent just how undeniably British this place remains. Restaurants downtown serve mushy peas and Marmite, with greasy fish and chips served in cones of newsprint. Gibraltar has its own currency, but it’s tied to the British Pound and features the Queen on all coins. Victorian-style red mailboxes and phone booths sit along the roads, while the Union Jack hangs from storefronts. With the pleasant, non-English weather and the fact the cars drove on the right (a pretty logical concession to its geographic reality), the town felt like a busy London neighborhood reflected through some weird looking glass. A journey up the rock made the experience more extraordinary. We took a cable car to the top, getting a nice view of the surprisingly lush cliffside and of the working harbor spread out below. Once on top, we immediately found the north-facing observation area, which offered breathtaking views of Gibraltar town and Spain beyond. It also offered a hangout for the rock’s most fascinating residents, the Barbary apes. As a subspecies of macaque, the apes are actually monkeys (allegedly mislabeled by their lack of tails), and the only wild primates anywhere in Europe. Wild, but unusually comfortable around people. During our two-hour hike along the rock’s long, rolling spine, we managed to see monkeys riding on the tops of tour vehicles, monkeys nonchalantly cleaning each other while dozens of people surrounded them, and one contented monkey munching on a sandwich he’d clearly swiped from some unsuspecting visitor. At one point, as I was putting my camera in its bag, I saw my friend pointing at me with some concern and immediately felt something heavy land on me. So I literally had a monkey on my back, reaching for my camera, and it took a couple of shoulder shrugs to make him jump back to his rock. There’s an old legend that Great Britain will hold Gibraltar as long as the monkeys hold the rock. (During World War II, Winston Churchill even made a point of reinforcing their dwindling population). Whatever the territory’s future, it’s hard to envision Gibraltar without its unique form of culture clash – or without its most mischievous attractions.